This is one of the few collector's sets that S.T.Dupont made in 2003 on the occasion of the 300th anniversary of the city of Saint Petersburg. 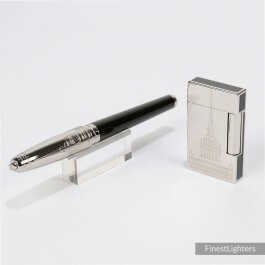 The set is made up of a limited edition Line 2 lighter and a limited edition large Olympio Fountain Pen, both finished in platinum and black Chinese lacquer, and engraved with Saint Petersburg's coat of arms and Admiralty building. Both the lighter and the pen are numbered 114/300.